How Do Your Donors Learn? I like books. I have a Kindle. But I prefer books. And not because I’m a bookophile who craves the smell and texture of books. And not because I like to have books as intellectual souvenirs as Seth Godin describes. No, I like books because I learn better from them. I have read a number of books using my Kindle. And, almost universally, when I complete the book and turn off my Kindle, I can’t recall more than one or two ideas worth remembering. And typically I forget those ideas within a few days. Sometimes I can’t even remember that I’ve read the book after a week or so. But, when I read a real, old-fashioned, page-turning book, not only can remember more important concepts and examples, I can remember where on the page those concepts and examples were printed. I can remember these ideas for years sometimes. For me, reading a physical book is much more of an experience than is the Kindle. Opening a book and flipping each page is tactilely and visually more stimulating than the static Kindle screen. It’s an experience that imprints itself more forcefully on my brain. Therefore, I remember and learn more and better. In consulting with advancement professionals I sometimes get the sense that they are preoccupied with employing the newest-latest technologies to educate and solicit donors. As an example, they may get excited about developing a digital version of their campaign case statement so that they can replace their old, seemingly-tired, printed case statements. On major donor visits, they want to whip out their iPad and show the new, enhanced case statement with digital media embedded. And this is fine. There is some merit to appearing cutting-edge and technologically progressive. The notion of buying an iPad or other technology to use with donors does not mean you will get better outcomes from donors. For some donors, the experience of flipping through a physical case statement may be more accessible and more effective. Others may want to come to a small group meeting where your president presents your campaign priorities and goals verbally. One technology or method of message delivery is not universally more effective than another in helping your donors learn. 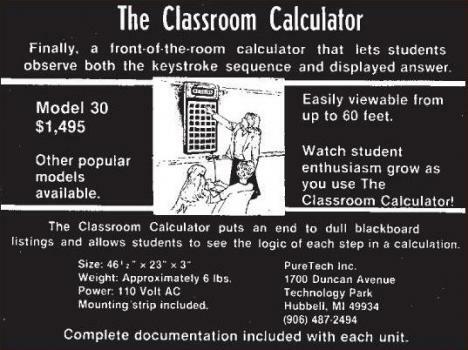 And some technologies, like the “Classroom Calculator” will turn out to be wholly unhelpful. You are an educator. What you teach is philanthropy and generosity. Your role is to educate prospective donors about the opportunities they have to become donors. As master educators know, the first step in moving learners from where they are today to where you want them to be is to better understand them and their learning styles. When you take the time to understand how your donors learn, you gain the needed insight to better educate them and encourage their generosity.